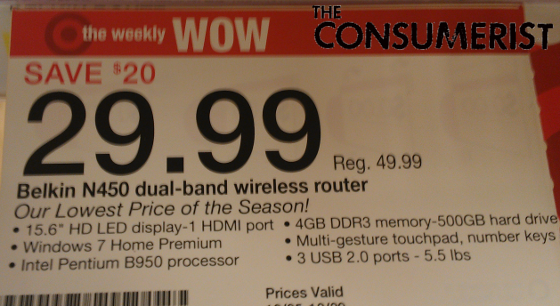 Consumerist reader Cameron was recently looking for a router at his local Target when he was intrigued by the “Weekly WOW” sale on a Belkin model. But when he looked at the specs, he was just blown away. “Wow” indeed. For only $29.95, Target wasn’t just selling your standard dual-band wireless router. It was a router with a 500 GB hard drive, a multi-gesture touchpad and — amazingly — a 15.6″ HD LED display. If we didn’t know better, we’d think this was all supposed to be describing a laptop computer and not a wireless router. Even more impressive, the regular price for this device is only $49.99. With all those specs, we’d expect to pay several times that amount. For some reason, we could not locate this product on the Belkin website. Must be a Target exclusive*. *We are aware this is a mistake made by someone at Target and not a real product. There is no need to send an e-mail correcting the error.